Using a self tanning lotion is believed by many to be one of the safest ways to get a tan without having to put your skin at risk of damage by lying out in the sun or in a tanning salon. For years, many people have enjoyed fake tans that lasted all year-round. It helps prepare your 'winter' body for long spells in the summer sun and also just makes you feel healthier and sexier when presenting well tanned. Actually, the truth is that your body IS much healthier if you expose it to the sun's UVB rays and allow a natural photosynthesis type process to take place, whereby your skin creates Vitamin D. However, it's not always possible to get out into the sun. So, if you've been debating about a method to choose in order to get that healthy, bronzed look for the summer, and you don't have time or access to outdoor sunshine, using a self tanning lotion may be an option you'll want to look into. Whether you are talking about sun tanning outdoors or self-tanning, the epidermis is where the real activity occurs. Our skin consists of two main layers: the epidermis on the outside and the dermis on the inside. The epidermis is also made up of layers. 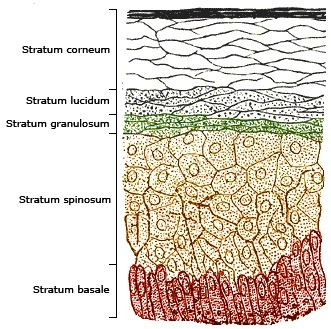 The deepest layer of the epidermis, called the stratum basale, or basal layer, is affected during sun tanning. However, the stratum corneum, or horny layer, is the outermost layer of the epidermis and it is this layer that is affected by most self tanning, or sunless tanning products. As the name suggests, these lotions are specially formulated so that your skin changes its color without any assistance from the sun's UV rays. There are a variety of such tanning lotions available at many stores where you normally find sunscreens and the main ingredient used that makes them work so effectively is known as DHA, or Dihydroxyacetone. DHA is a colorless sugar that interacts with the dead cells located in the stratum corneum of the epidermis. As the sugar interacts with the dead skin cells, a color change occurs. This change usually lasts about five to seven days from the initial application. There are many times in the past that I can recall seeing people with a strange orange colored skin but technology for self tanning lotions has come a long way and nowadays consumers don't really have to worry about sporting an unsightly orange hue. Newer formulas now allow the tanning lotion to develop a shade that is closer to your skin's natural color by working with your skin's existing pigments. Many shades of self tanning lotion are listed as "light to medium" or "medium to dark," while others offer a helpful color spectrum where you can actually choose your shade. Needless to say, it pays to take some time to test your skin with the chosen tanning lotion on a small area of your skin upfront, before applying to the whole body or whole face. Every day, millions of dead skin cells are sloughed off or worn away from the surface of your skin. In fact, every 35 to 45 days, you have an entirely new epidermis. This is why tans from self tanning lotions will gradually fade - as the dead cells are worn away, so is your tan. For this reason, most of the self tanning lotions will suggest that you reapply about every three days to maintain your "tan." Exfoliate This is the best advice of all. Exfoliating your skin a few days before your application will allow it to shed a lot of its dead scaly layers, thus maximizing the effect of the tanning lotion. Rub body scrub all over your body, making sure you spend time on the areas that tend to be more dry and scaly, such as the knees and elbows. Moisturize If not a week, at least a few days before you use the self tanning lotion, apply body moisturizing lotion quite liberally immediately after bathing. The aim is to try and prevent the typically drier areas, such as the knees and ankles, from soaking up the tanning lotion, which leads to blotchy coloring. Keeping your skin plumped up with moisture will help prevent this. Avoid applying tanning lotions in hot, steamy bathrooms. Applying in a hot and moist environment that encourages sweating may cause the lotion to melt and drip, causing streaks. Hot skin can have the same affect too, so wait until your body has cooled down. Don't rush. Self tanning lotions take longer to dry than foam. So if rushed, go with a foam. Although easy to apply by yourself, having someone to assist you makes it easier. Start systematically with one area and work your way around, paying attention to each part and not rushing. Moving slowly and carefully will obtain better, more even results. Dilute the lotion for specific areas.Your knees, ankles and elbows are usually the first to take on a more intense color. To prevent this, dilute the self tanning lotion by half for these areas, by adding some moisturizer for a more natural look. Protect your hands while applying. Wear latex gloves or wash your hands often while applying the self tanning lotion. For application to the back of your hands, use a damp makeup sponge to keep the self tanner off your palms. This works well for the top of your feet as well. Wait before getting dressed.If your self tanning lotion has not dried properly, it will rub off on your clothes and stain them, so wait until it has dried off. Although these tanning lotions that contain DHA are believed to be the most reliable, there are some other ingredients on the market. Tanning accelerators, as lotions or pills, usually contain the amino acid tyrosine, which is claimed to stimulate and increase melanin formation, thereby accelerating the tanning process. It's important to remember that most of these products, unless they contain an added sunscreen, will not protect you from the sun's UVA and UVB rays. Even self tanning lotions that do contain a sunscreen won't be of much help, since they lose their efficacy within hours of application. So, if you're planning to head outside to show off your new glow, be sure to apply some extra sunscreen.